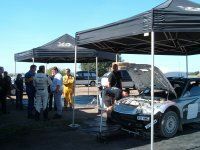 The HPM Team has a superb knowledge from the World Rally Championship to Single Venue Events, and can run your car , or any of our cars on any event you should choose from the Tarmac of Ireland to the Gravel of New Zealand. We have the experience and Logistics to make any rally not only a pleasurable experience but cost effective as well. HPM have available WRC , Group N and Historic Rally cars for hire , for a single event or a complete championship the choice is yours - call us for advice on the best deal for you. We can prepare any car from Historic Rally cars right through to the latest World Rally Cars in our purpose made workshops.We have achieved through careful preparation a reliabilty record which is envied throughout the sport, and when the inevitable problems do occur we have the equipment and know how to ensure it doesnt affect your results ! We have run many sponsorhip programmes in conjuction with various sponsors and drivers, and have great pleasure in ensuring that the sponsors and their clients enjoy every second!